Olefin Metathesis entails the redistribution of fragments of alkenes by the scission and regeneration of carbon-carbon double bonds mediated by transition metal carbene complexes. 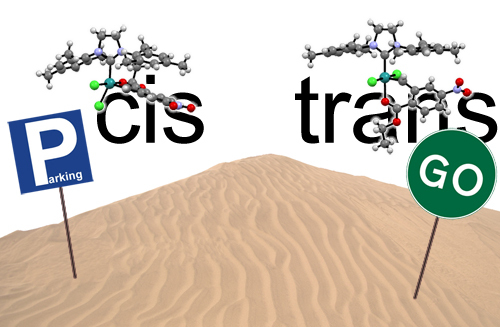 The isomerization of cis- and trans-dichloro ruthenium carbene catalyst-precursors and its implication for the catalysis is one of key topics of the group. "Converting natural rubber waste into Ring-opening Metathesis polymers with oligo-1,4-cis-isoprene sidechains." "Ruthenium-amide Complexes - Synthesis and Catalytic Activity in Olefin Metathesis and in Ring Opening Polymerization"
"Historical Overview of N-Heterocyclic Carbenes in Alkene Metathesis." "Simple activation by acid of latent Ru-NHC-based metathesis initiators bearing 8-quinolinolate co-ligands." "Variation of the Sterical Properties of the N-Heterocyclic Carbene Coligand in Thermally Triggerable Ruthenium-Based Olefin Metathesis Precatalysts/Initiators." "Consequences of the Electronic Tuning of Latent Ruthenium-Based Olefin Metathesis Catalysts on Their Reactivity." "Mechanism of the Ru-Allenylidene to Ru-Indenylidene Rearrangement in Ruthenium Precatalysts for Olefin Metathesis." "Initiation efficacy of halo-chelated cis-dichloro configured ruthenium based second generation benzylidene complexes in Ring-opening Metathesis Polymerization." "On the chloride lability in electron-rich second generation ruthenium benzylidene complexes." "A theoretical view on the thermodynamic cis-trans equilibrium of dihalo ruthenium olefin metathesis (pre-)catalysts." "Synthesis of Homopolymers and Copolymers"
"Industrial Applications of Olefin Metathesis Polymerization." Slugovc, C. in Olefin Metathesis: Theory and Practice, K. Grela (Ed.) John Wiley & Sons, 2014, p. 329-334. "Chelating Ruthenium Phenolate Complexes: Synthesis, General Catalytic Activity, and Applications in Olefin Metathesis Polymerization." "Two commercially available initiators for the retarded ring-opening metathesis polymerization of dicyclopentadiene." "Impact of Electronic Modification of the Chelating Benzylidene Ligand in cis-Dichloro-Configured Second-Generation Olefin Metathesis Catalysts on Their Activity." "A modular approach towards fluorescent pH and ascorbic acid probes based on ring-opening metathesis polymerisation." "Mixed N-heterocyclic carbene/phosphite ruthenium complexes: the effect of a bulkier NHC." "Low catalyst loading in the cross metathesis of olefins with methyl vinyl ketone." "Energetics of the Ruthenium-Halide Bond in Olefin Metathesis (Pre)catalysts." "Exploring New Generations of Ruthenium Olefin Metathesis Catalysts: The Reactivity of a Bis-ylidene Ruthenium Complex by DFT." "Organic field-effect transistor based sensors with sensitive gate dielectrics used for low-concentration ammonia detection." "Halide Exchange in Second-Generation cis-Dihalo Ruthenium Benzylidene Complexes." "A latent ruthenium based olefin metathesis catalyst with a sterically demanding NHC ligand." "On the isomerization of a trans-dichloro to a cis-dichloro amide-chelated ruthenium benzylidene complex and the catalytic scope of these species in olefin metathesis."